The Grand Bazaar (Turkish: Kapalıçarşı, meaning ‘Covered Market’; also Büyük Çarşı, meaning ‘Grand Market’) in Istanbulis one of the largest and oldest covered markets in the world, with 61 covered streets and over 4,000 shops which attract between 250,000 and 400,000 visitors daily. In 2014, it was listed No.1 among the world's most-visited tourist attractions with 91,250,000 annual visitors. 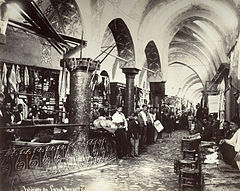 The Grand Bazar at Istanbul is often regarded as one of the first shopping malls of the world.The construction of the future Grand Bazaar's core started during the winter of 1455/56, shortly after the Ottoman conquest of Constantinople and was part of a broader initiative to stimulate economic prosperity in Istanbul. Sultan Mehmet II had an edifice erected devoted to the trading of textiles and jewels near his palace in Constantinople. It was named Cevâhir Bedestan ("Bedesten of Gems") and was also known as Bezzâzistan-ı Cedîd ("New Bedesten") in Ottoman Turkish. The word bedesten is adapted from the Persian word bezestan, derived from bez ("cloth"), and means "bazaar of the cloth sellers".The building – named alternately in Turkish İç ("Internal"), Atik ("Ancient"), or Eski ("Old") Bedesten – lies on the slope of the third hill of Istanbul, between the ancient Fora of Constantine and of Theodosius. It was also near the first sultan's palace, the Old Palace (Eski Sarayi), which was also in construction in those same years, and not far from the Artopoleia (in Greek) (Άρτοπωλεία), the city's bakers' quarter in Byzantine times. The construction of the Bedesten ended in the winter of 1460/61, and the building was endowed to the waqf of the Aya Sofya Mosque. Analysis of the brickwork shows that most of the structure originates from the second half of the 15th century, although a Byzantine relief representing a Comnenian eagle, still enclosed on the top of the East Gate (Kuyumcular Kapisi) of the Bedesten has been used by several scholars as proof that the edifice was a Byzantine structure. In a market near the Bedesten, named in Turkish Esir Pazarı, the slave trade was active, a use also carried over from Byzantine times. Other important markets in the vicinity were the second-hand market (Turkish: Bit Pazarı), the "Long Market" (Uzun Carsi), corresponding to the Greek Makros Embolos (Μακρός Ὲμβολος, "Long Portico"), a long porticoed mall stretching downhill from the Forum of Constantine to the Golden Horn, which was one of the main market areas of the city, while the old book market (Sahaflar Carsisi) was moved from the Bazaar to the present picturesque location near the Beyazid Mosque only after the 1894 Istanbul earthquake .Some years later—according to other sources, this occurred in 1545 under Sultan Suleyman I—Mehmet II had another covered market built, the "Sandal Bedesten" (the name comes from a kind of thread woven in Bursa, which had the colour of sandalwood), also named Küçük ("Little"), Cedit or Yeni (both words meaning "New") Bedesten, which lay north of the first. After the erection of the Sandal Bedesten the trade in textiles moved there, while the Cevahir Bedesten was reserved for the trade in luxury goods. At the beginning the two buildings were isolated. According to the 16th-century French traveller Pierre Gilles, between them and the Mosque of Beyazid stood the ruins of churches and a large cistern;.However, soon many sellers opened their shops between and around them, so that a whole quarter was born, devoted exclusively to commerce. At the beginning of the 17th century the Grand Bazaar had already achieved its final shape. The enormous extent of the Ottoman Empire in three continents, and the total control of road communications between Asia and Europe, rendered the Bazaar and the surrounding hans or caravanserais the hub of the Mediterranean trade. According to several European travellers, at that time, and until the first half of the 19th century, the market was unrivalled in Europe with regards to the abundance, variety and quality of the goods on sale. At that time we know from European travellers that the Grand Bazaar had a square plan, with two perpendicular main roads crossing in the middle and a third road running along the outer perimeter. In the Bazaar there were 67 roads (each bearing the name of the sellers of a particular good), several squares used for the daily prayers, 5 mosques, 7 fountains, 18 gates which were opened each day in the morning and closed in the evening (from these comes the modern name of the Market, "Closed Market" (Kapalıçarşı).Around 1638 the Turkish traveller Evliya Çelebi gave us the most important historical description of the Bazaar and of its customs. The number of shops amounted to 3,000, plus 300 located in the surrounding hans, large caravanserais with two or three storeys round a porticoed inner courtyard, where goods could be stored and merchants could be lodged. In that period one tenth of the shops of the city were concentrated in the market and around it. For all that, at that time the market was not yet covered. A dolap in a drawing of Cesare Biseo, from Edmondo De Amicis's Costantinopoli (1882 edition)Recurrent calamities, fires and earthquakes hit the Grand Bazaar. The first fire occurred in 1515; another in 1548. Other fires ravaged the complex in 1588, 1618 (when the Bit Pazari was destroyed), 1645, 1652, 1658, 1660 (on that occasion the whole city was devastated), 1687, 1688 (great damage occurred to the Uzun Carsi) 1695, and 1701. The fire of 1701 was particularly fierce, forcing Grand Vizier to rebuild several parts of the complex in 1730–1731. In 1738 the Kizlar Aĝasi Beşir Ağa endowed the Fountain (still existing) near Mercan Kapi. Actually, the main reason of concentrating the trade in one place was to provide the highest security against theft, fire and uprising. The goods in the Bedesten were guaranteed against everything except turmoil. Gates were always closed at night, and the bazaar was patrolled by guards paid by the merchants' guilds. In order to access the complex during night hours, an imperial edict was required. The only official night opening in the history of the Bazaar occurred in 1867 during the feast organized for the return of Sultan Abdülaziz from Egypt, when the sovereign crossed the illuminated market riding a horse among the rejoicing populace. Despite the immense wealth present in the Bazaar over the centuries—as an English traveller recorded as late as c. 1870, a tour of the inner Bedesten could easily ruin a few Rothschild families—theft occurred extremely rarely. The most important such incident happened in 1591, when 30,000 gold coins (Turkish: Altın) were stolen in the old Bedesten. The theft shocked the whole of Istanbul, the Bazaar remained closed for two weeks and people were tortured, until the money was found hidden under a floor matting. The culprit was a young Persian muskseller. Thanks to the intercession of the Sultan Murad III he was executed by hanging and not by torture. The Zincirli Hanı, a former caravansary where jewelry is now produced.Right during the westernization of Ottoman society, the Grand Bazaar became an obligatory topos of the romantic literature. We owe descriptions of the Bazaar in the middle of the 19th century Right during the westernization of Ottoman society, the Grand Bazaar became an obligatory topos of the romantic literature. We owe descriptions of the Bazaar in the middle of the 19th century to writers such as Edmondo De Amicis and Théophile Gautier. Another peculiarity of the market during the Ottoman age was the total lack of restaurants. The absence of women in the social life and the nomadic conventions in the Turkish society made the concept of restaurant alien. Merchants brought their lunch in a food box called sefertas, and the only food on sale was simple dishes such as doner kebab, tavuk göğsü (a dessert prepared with chicken breast, milk sugar and rose water sprinkled on it) and Turkish coffee. These simple dishes were prepared and served in small two-story kiosks placed in the middle of a road. The most famous among these kiosks is the one—still extant but not functioning any more—placed at the crossing of Halıcılar Caddesi and Acı Çesme Caddesi. It is alleged that Sultan Mahmut II came there often in disguise to eat his pudding.The Bazaar was in the Ottoman Age the place where the Istanbullu (the inhabitants of the city) could see each other. Not only was the market the only place in town where the ladies could go relatively easily (and this circumstance made the place especially interesting for the Europeans who visited the city), but—especially from the Tanzimat age on—it was also the only public place where the average citizen had a chance to meet the members of the Imperial Harem and of the Court casually.